Pruning : between January and March. This is a very important job, as it permits to limit the yield by longer or shorter pruning according to vine varieties. Some vines, being more subject to hail, are pruned in a different way (called “cordon de royat”). Trimmings will be crushed to use as natural fertilizer. Planting and Repairing : in April. Posts and wires are repaired and replaced. Cuttings are lifted from the nursery and planted. Bud and Shoot Trimming (évasivage) : from April to May. Together with pruning, this is the most important job. Stem by stem and according to grape position, double buds are removed, as well as unwanted shoots, as these suckers that would exhaust the vine. It also serves to control yield further. Pulling Back (relevage) : from May to July, as vegetation grows, it must be protected from the wind and branches must be tied between two training wires. Should this job not be done in time, a large part of the crop might be lost. Trimming (rognage) : The mechanical cutting of shoot tips above the wires and on both sides. Fertilizing and Disease Control : Controlling the amount of organic fertilizers is crucial, as an excess gives vegetation extra-strength and increases the risks of rot. Parcels are treated according to rain quantities and heat. If it is not done in time, the crop may be threatened of serious yield losses. Green Harvesting and Leaf Management : Green harvesting (thinning each vine to one bunch per shoot in August) and leaf management (removing excess of leaves) are not done systematically, but only in late and wet years, as in 2002 or 2004. Harvest : Grapes are picked by hand and a sorting-table is used. 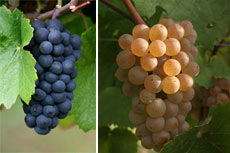 Harvest usually takes place in late September or early October. It is the main time of the year, when stress and joy gather with ten to fifteen grape-harvesters for eight to ten days. 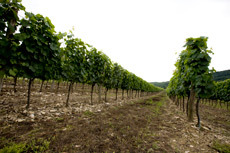 Wine-growing is the crucial time for the quality of the future wine. For red wine: After sorting and de-stemmning, the wine is placed into large open vats. Traditional vat fermentation lasts for ten days to a fortnight, with daily pressings, temperature controls and lifts (the wine is aired by pumping up and pouring back on top of the cap of skins and seeds forced to the top by fermentation). Once alcoholic fermentation is over, the new wine is racked, pressed and placed into the cellar. For white wine : After sorting, the grapes are pressed and placed in vats. After a few days, the juice is cleared, and then regularly cooled so as to ferment at a low temperature for 15 to 20 days. 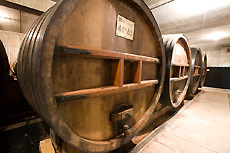 Once alcoholic fermentation is over, the wine is racked and placed into the cellar. After sorting, the grapes are pressed and placed in vats. After a few days, the juice is cleared, and then regularly cooled so as to ferment at a low temperature for 15 to 20 days. 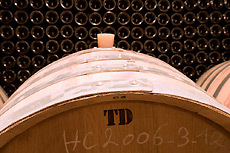 Once alcoholic fermentation is over, the wine is racked and placed into the cellar. The bottles are stored naked in piles or pallets in the cellar. According to demand, they are labelled for trading.